Reason for recall: Salmonella. Click here for more details. 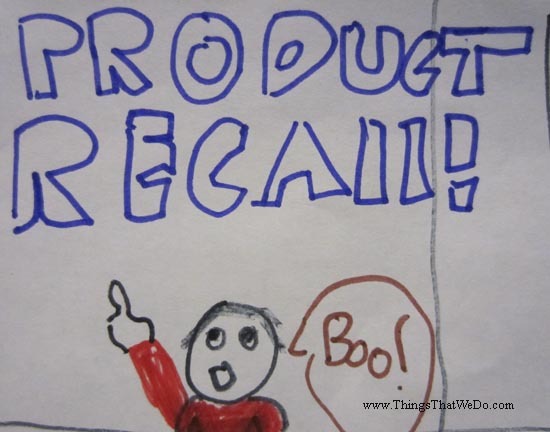 Reason for recall: potentially reduced bioavailability of nutrients Click here for more details. Reason for recall: the recalled ceiling lamps can detach from the ceiling and well, you know…. Click here for more details. Reason for recall: choking hazard Click here for more details. Reason for recall: fire hazard. Click here for more details. Reason for recall: the work boot products identified have a tag with an unauthorized CSA marking Click here for more details. Reason for recall: potential fire or shock hazard. Click here for more details. Reason for recall: electrical hazard. Click here for more details. Reason for recall: injury hazard. Click here for more details.